– Swap books on http://www.paperbackswap.com (see my previous post on “My favorite find – swapping books.” You can create your own wish list and then get books as they become available from other members. – Also shop at your local children’s resale shop for used books. I have found great chapter books this way. – Sign up for emails from Scholastic, too, and you will be alerted to their local warehouse sales, where you can snag great deals on professional and kids’ books. – Scholastic.com has a fairly new program on their teacher homepage called Teacher Express. You can get eBook versions of their various teaching books. Several times last year offered 500-600 titles for just $1! My co-teacher and I stocked up on lots of great titles that we use all the time. – Before buying a professional book directly from the publisher or teacher catalog, be sure to check the price on Amazon. You can often get a new or used one for much cheaper there. – Take advantage of the numerous teacher websites online that offer free lesson plans and materials. 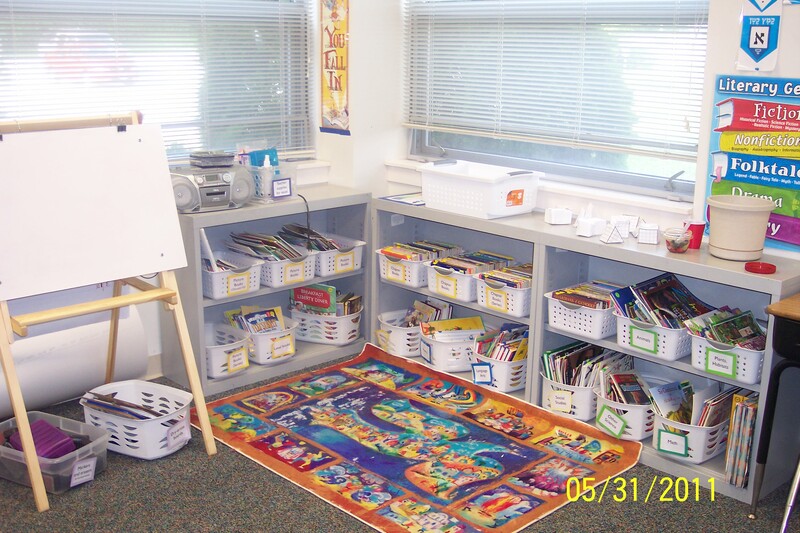 – I always have my own set of supplies in the room for students to use if they do not have their own, something gets lost, or if I have students from other classes working in my room. They include: file folders, spirals, colored pencils, crayons, markers, glue, glue sticks, a few scissors, and index cards. I can normally get the other items I need from the school office or our beginning of the year supply order. Stock up on these now during the back-to-school sales. – This is also a good time to get binders and folders for your own files and resources. 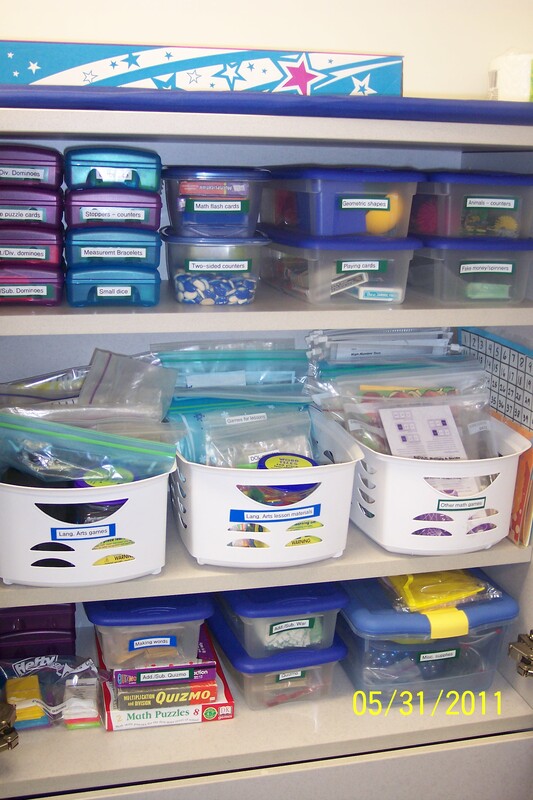 – Containers and bins: With students moving into college, now is a good time to get plastic containers or cloth bins that you need to organize your classroom or store things. My cabinet with games, manipulatives, and centers. – Use your newsletter to let parents know of any classroom wish list items. Parents are often willing to help out if they know what you specifically need. Last year we were short on playground toys and a generous parent sent in jump ropes and balls. This is also good to do around the holidays and end of the year. It can never hurt to ask! – OfficeMax, Office Depot and Staples also have special Teacher Appreciation Days before school starts where they give away free stuff and special discounts. – Show your teacher ID at other stores and ask the manager if they have any extra supplies they would be willing to donate to your school or their own teacher discount program. – Scrapbook paper: I like to use this to mount things that I plan to laminate and use over and over again like for games or bulletin boards. Wal-Mart has cheap multipacks of scrapbook paper, which won’t fade and is thicker than regular construction paper. – Tissue paper: I like to buy the large multi-packs from an art supply store or Wal-Mart (if they have a good craft section) to keep on hand for various art projects. – Foam stickers: Look for these at your local craft store or Wal-Mart. They big tubs are great for a variety of projects. – Teacher-store sales: Back-to-school time is when teacher stores often run their own sales. They will often have certain brands on sale certain weeks. Check out your local store for details. – Yard sales, flea markets, swap meets, auctions: If you have time to shop yard sales, these can be a great place to find books, toys, games, craft materials, decorations, organizing materials, fabric, clothing for costumes, etc. Go at the end of the day when sellers are most often willing to get rid of items at low prices. You can also sometimes find items at Good Will, Salvation Army and other resale shops. – Teacher resource centers: Various organizations around the country collect high-quality industrial items to sell for “creative reuse.” Some reuse centers also offer workshops and classes. – Free publicity: Write to publishers to ask for publicity materials for various books your class is reading (newer books are best). These packets may include posters, fact sheets, DVDs with author interviews and other resource materials. Plan appropriately because the materials may take a few weeks to come. Your local bookstore may have these materials as well. – Contact companies you like: If you have a product you just love and use often, let them know. Send an email and tell the company you are a teacher and would love samples if possible. – Kids in Need Resource Centers: If 70 percent of the students in your school are enrolled in the federal free lunch program, you are eligible to shop at a Kids in Need Resource Center. Kids in Need gets supplies to kids and teachers from manufacturers and retailers such as 3M and OfficeMax. To find a location nearby, go to http://www.kinf.org/. – http://DonorsChoose.org is an online charity that connects donors with classrooms in need. You submit a project proposal to the website and ask for a set amount of money to purchase something specific. Items are sent directly to your school if your project gets funded. – http://iLoveSchools.com lets teachers “shop” in their store and create a wish list of products, services, and resources. Donors can browse your wish list and purchase specific items for your classroom. – http://supplyourschools.org/ connects teachers in under-privileged schools with donors to help provide students with basic class materials. Using a gift registry setup, teachers list items their students need, and donors select what they’d like to purchase. – http://www.adoptaclassroom.org/index.aspx links donors with classrooms, and teachers use the donations to purchase supplies through the site’s network of online vendors. * Additional tips from “How to Find Things for Free (or Nearly Free)” by Louise Rozett on http://www.scholastic.com.